Fresh fruit salad with mint, honey and lime juice is perfect to have as a dessert or for breakfast as a healthy start for the day. You can use any kind of fruits you have or like. I had some fresh strawberries and blue berries at home so bought some more colorful fruits and added to this yummy and fresh salad. This dish goes as my 3rd dish for BM 62 under the theme " Salads". Chop or cut the fruits in what ever shape or size you want. In a mixing bowl add honey, lime juice and fresh orange juice taken from the orange. Mix well and add all the chopped fruits. Mix them well and refrigerate for about 1 hour or till you serve. Add chopped mint leaves for extra flavor, I skipped this as my kids are not fond of it. Can be served with pudding or ice cream or as it is. I always used to see fresh corn and cucumber at the road side sellers during late summers and rainy seasons. We also used to see them selling fresh mint and lime juice, sugar cane juice and Fresh coconut water. These used to keep our body cool and the hot summers. Cucumber contain lot of water in it where as mint is a medicinal herb which is used in many medicines to treat stomach pain and chest pain. Sweet corn increases levels of ferulic acid which has anti cancer properties. A salad is a dish consisting of small pieces of food which may be mixed with sauce or salad dressing. Salads are usually served cold. Salads have variety of vegetables, cheese, cooked meat eggs , grains or leafy vegetables. Salads are served as an appetizer, main course or even dessert. Appetizer salad are very light as a first course of the meal. Main course salads are which contain of cooked chicken, eggs or any other meat. Dessert salads are the sweeter version of salad which include fresh fruits, whipped cream or custards. Today I am here with a Mexican Chickpea salad which is quick and east to make. I have named this Mexican Chickpea salad because this dish has Avocado, chickpeas and Jalapeno which are typically used in Mexican Cuisine. This dish goes to the first day's post for BM 62, week 4 under the Theme "Salads". The coconut is known for its great versatility as seen in many uses of its different parts.Coconuts are part of daily diets of many people.They are different form any other fruit because they contain large quantity of water. When dried , coconut flesh is called Copra. The oil and milk derived from it are commonly used in cooking and frying. Today I am here with a simple rice dish with freshly grated coconut and cilantro. Cilantro gives nice flavor and color to the rice. 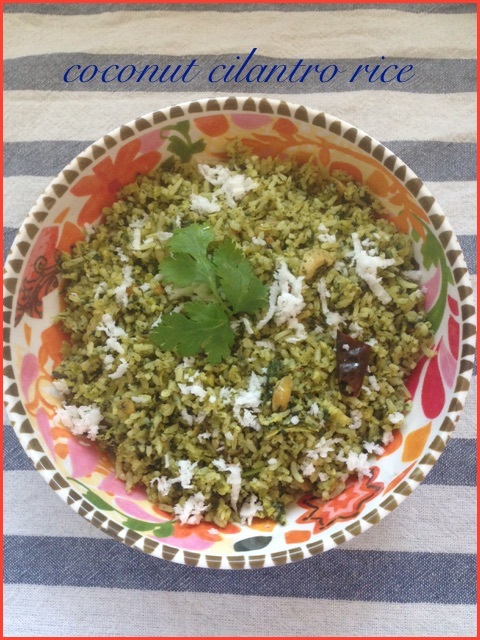 This dish goes to the 3rd day of BM 62, week 2 under the theme "Cook with Coconut". Wash cilantro thoroughly and add it to the mixer grinder and add 2 to 3 spoons water. Grind it to make a course paste. Heat a large pan and add oil. This is one of the simplest dessert I have ever made. Blend everything, chill and serve..... that's it. Saw this simple and delicious Mango Coconut pudding on Facebook, and it attracted me so much that I made it the following weekend for a small gathering at my place. We had 2 more desserts on the menu but my Mango Coconut Pudding was the super hit among kids and grownups. Kari Ayam is a Malaysian chicken curry with is typically made with coconut milk and some spices. We had this curry in one of the Malaysian Restaurant called "Penang". This curry is served with Roti as an appetizer. The name of the dish is "Roti Canai" which means puffed bread served hot with curry or dal. So we were served with a creamy chicken curry along with the roti. When we first tasted this dish, we felt as if we were eating a Indian dish. It had all the flavors of Indian Masala and the roti was a typical Kerala Parota. Our family loved this dish. Thought why not make this curry at home, so I googled the recipe and found that this recipe is very simple to make with minimal ingredients. I served this curry with home made Rumali Roti, and it tasted awesome, the same texture, flavor and color of that of Restaurant Style Kari Ayam. So this recipe goes to BM 62, week 2, Day 1, under the theme " Cook with coconut".